Cult Heroes; every club has players from the past who particularly stand out and are remembered for many reasons. A cult hero can be admired by a large or relatively small audience, but remains influential all the same. 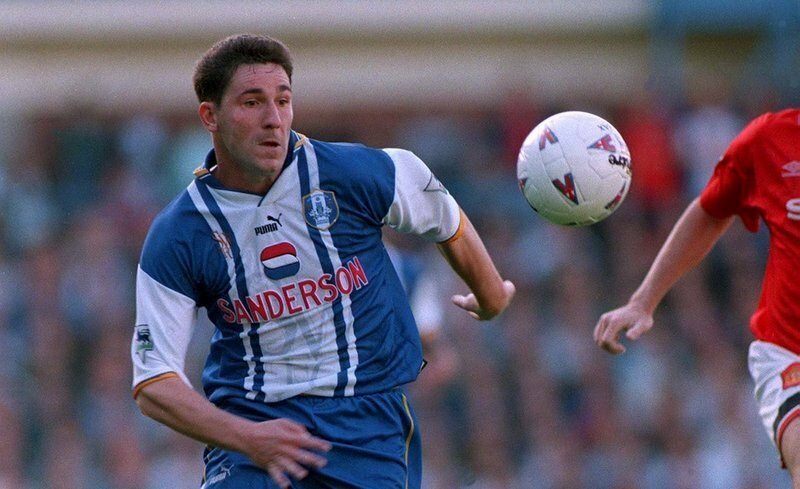 This week, Louis Shackshaft has taken a look back at former Sheffield Wednesday striker David Hirst. Born in Barnsley, Yorkshire, Hirst was part of the England Under-21, England-B and full England international set-up throughout his career. He earned three caps for his country, finding the net on one occasion against New Zealand. David was an ‘all-rounder’ in terms of ability. With pace, dribbling skills, height and an aerial presence, he was a manager’s dream. Hirst was renowned for scoring goals and could do so with both feet, although he was predominantly left footed. Sheffield Wednesday’s David Hirst and John Harkes (right) celebrate. The 5ft 11in marksmen had a career span of over 15 years. Hirst made his name at Barnsley after contributing with nine league goals in 28 appearances after signing for the Tykes professionally as an 18-year-old. Having made such an impact at a young age in the second division, Hirst began to attract some serious attention. Under then manager Howard Wilkinson, Sheffield Wednesday signed Hirst on August 11, 1986, for £250,000. Hirst’s debut came in the first game of the 1986-87 season in a 1-1 draw against Charlton Athletic at The Valley. Furthermore, a week later Hirst made his mark in a fixture against Everton at Hillsborough. The Owls number nine found the net just a few minutes after arriving on the field of play as a substitute in front of 33,000 spectators. His legendary status had began. Hirst quite amusingly scored and kept a clean sheet in the same match against Manchester City in 1989-90 campaign. Having already scored, the Owls front-man replaced an injured Kevin Pressman in the sticks. Wednesday ran out 2-0 winners. A fixture still remembered by many Wednesdayites. Due to Hirst’s prolific goalscoring record, Sir Alex Ferguson tried to lure the Wednesday forward to Manchester United on a couple of occasions in the early 1990’s for a fee reported to be £3 million. However, the offers were rejected and United subsequently signed Eric Cantona instead. In September 1996, Hirst found himself in the record books after hitting the fastest shot recorded against Arsenal at Highbury. The speed of the shot recorded was 114mph! The Sheffield Wednesday talisman became a S6 marvel, spending a total of eleven years at the club. In this period, Hirst scored a remarkable 106 league goals in 294 appearances and was part of the winning team that won the League Cup in 1991 in a 1-0 victory over Manchester United. In addition, the Owls striker helped Sheffield Wednesday reach both of the domestic cup finals in 1993, both against Arsenal. However, he was on the losing team each occasion despite scoring in the FA Cup final. The Wednesday faithful continue to idolise Hirst and he has gone down in Wednesday folklore as one of the best players ever to grace the Hillsborough turf. After re-occurring injury problems, Hirst was sold by manager David Pleat to Southampton for £2 million in October 1997. In 30 appearances, Hirst managed to score nine league goals, before retiring in January 2000 at the age of 32 as injuries continued to take their toll. Everyone associated with Sheffield Wednesday would like to thank David for the memories he gave us throughout the late 1980’s and 1990’s. Those memories will live with us forever.